For a long-lasting smile, we invite you to discuss your needs with Dr. Massoomi. Let us figure how dental implants can help you achieve the smile that you have always wanted. Dr. Massoomi uses the latest implant technology to rebuild and re-establish a beautiful smile. Dental implants can be the right choice for patients who need to replace one or more missing teeth. Dental implants create a natural look while restoring the strength and functionality of your true smile. Before placing your dental implant, Dr. Massoomi will conduct a comprehensive exam to determine whether your jawbone and gums can support an implant. 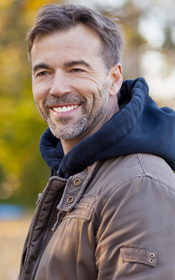 If you have missing teeth and a healthy jaw, you may be a candidate for dental implants. We will obtain either an x-rays or a 3D CBCT image of your jaw and take digital impressions of your gums to determine the ideal locations for your dental implants. Dr. Massoomi prides himself on placing the majority of his dental implants using CBCT-guided surgical guides. He has published multiple articles on this technique in order to validate the accuracy of his surgical techniques. In most instances you will be IV sedated in order to relax you during the procedure and to provide you with IV medication that will speed up your recovery and prevent post-operative complications such as nausea or vomiting. In most instances Dr. Massoomi will place sutures around the dental implants that need to be monitored closely after surgery. You will need at least 3-6 months of healing time for the implant to “osseointegrate” so that the bone grows around the implant. Once the dental implant has fully osseointegrated, we will refer you back to your general dentist so that you can get started with the tooth replacement portion of the procedure. A custom-made crown will be fabricated by your dentist that will screw into your implant in order to restore your smile. Each dental implant reduces the stress on the surrounding teeth by offering independent support for the crown, without any need to damage the adjacent teeth as it is done with traditional bridgework which require “prepping” or removing the enamel of the tooth to secure the bridge. Dental implants stimulate and preserve the underlying jaw bone. This helps to prevent the natural loss of jaw bone, that is very similar to what is seen in osteoporosis. A dental implant typically lasts much longer than conventional bridge. Dental implants are just like natural teeth when it comes to cleaning. The benefits of replacing missing teeth with tooth implants are well worth the expense. They help to prevent the shifting of adjacent teeth which can further ruin your smile. To schedule your commitment-free consultation about tooth implant surgery, please contact us today via phone, text, or using the contact form on this page. We are happy to accommodate your needs at either our San Francisco or Cupertino office.